Hafiq Azmi: What next for baby hulk? The conclusion of the largest motorcycle racing world championship competition recently clearly displays how the Spanish riders are currently dominating the top level of each classes. But it is no secret that they have some of the most advance development program and being backed up by a few of them huge teams on the Spaniard ground. For us in Malaysia on the other hand, there are only a few teams that are directly involved with the premier level of motorcycle racing currently. That somehow put a little disadvantage to our upcoming riders that clearly has the talent to go even further. After looking at the 2015 riders entry, we are quite disappointed to see that there’s no Hafiq Azmi to be competing in the class next year. 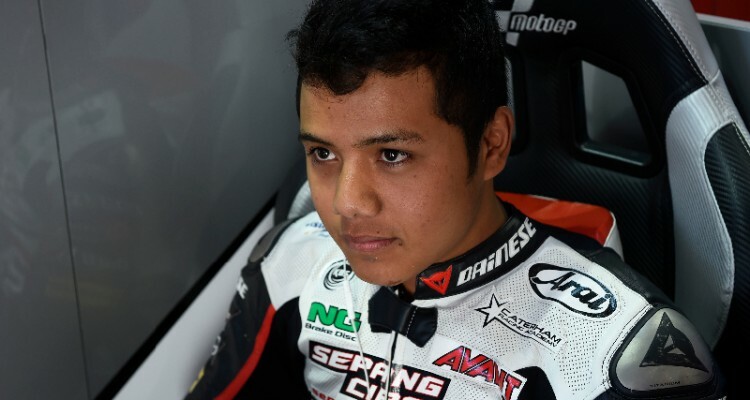 In a recent statement by SIC, the team that was responsible in managing Hafiq Azmi for his run in the Moto3 class this year; they are no longer to support the Ampang based rider. This was all due to his less than impressive showing in the 2014 season, although the 18 years old Hafiq did managed to score 3 points on his home grand prix in Sepang recently; it was deemed a little bit too late to impress the management of SIC Racing Team. The Malaysian Moto3 outfit however signed the Malaysian hotshot Zulfahmi Khairuddin and Jakub Kornfeil of Czech Republic. The decision to sign these two riders is a no brainer since the SIC team are looking to be competitive in 2015 Moto3 campaign. But what is next for our own Baby Hulk, the previously #34 rider seems to be silence with his future at this moment. Us in Malaysian Riders will be looking to get in touch with Hafiq in the near future to know more of his plan and if there is any offers or approach by him to get a placement in any of the team for Moto3 next year. For us in Malaysian Riders, we clearly see that Hafiq is the man to be developed further as he has been racing in the top level for quite a while in his youth. At 18 years old, he certainly has a great long years ahead to become of the best rider from Malaysia to compete in the world championship. But at this moment, everything seems to be in a dark and that doesn’t look good for him. Stay tune with us for more updates soon and we will do our very best to support Hafiq Azmi along with all the other Malaysian rising stars of motorcycle racing. The future of Malaysian motorsports especially in 2 wheels segment are looking great but let’s not be complacent and mismanaging the current pool of riders that we have right now. Spain gets to be at the top of the world in 2 wheels motorsports now for a reason, they’ve spent years of developing their athletes and certainly giving them the opportunities to work for their future. Hang out with us for more motorsports update on FACEBOOK and our YOUTUBE CHANNEL.